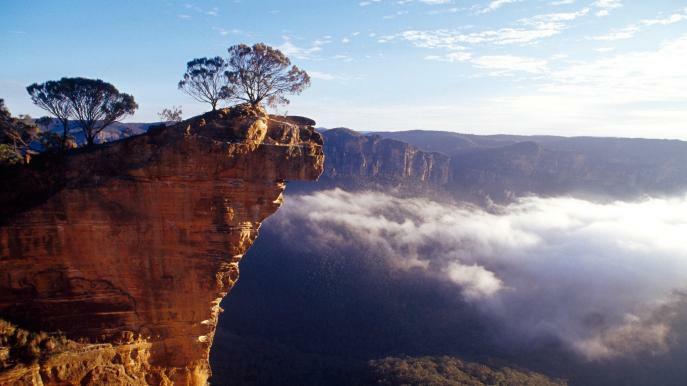 The Blue Mountains region and the town that bears its name is the ideal destination for anyone who wants to experience the majestic side of New South Wales. From the Three Sisters at Echo Point to the many spas, golf courses, and other attractions in the area, there is no shortage of things to do and see. Whether you're on your honeymoon or simply looking to get away with the family, this is the place to be. There are a number of villages dotting the landscape, all framed within the glorious Blue Mountains. The area's calendar is bursting with activities and events throughout the year, and even on a slow day nature itself provides all the activity anyone could ever want. The area caravan sites are situated in bushland, so nature is always a close companion during your stay. Bring the family. Bring your friends. Or just come for a romantic vacation with that special someone in your life. Just be sure to leave yourself enough time to explore all that the area has to offer! This park is maintained and run by the Blue Mountains City Council, one of two parks they provide for tourists to the area. It’s close to Blackheath's parks, pool, and cafes, and located in the heart of the Blue Mountains. It offers both powered and unpowered sites for caravans, campers, and tents. This is an award-winning site that offers coin laundry, camp kitchen, barbecues, shower, toilets, and other amenities. There's even Wi-Fi for those who just can't bear to be totally separated from the modern age! It's an enchanting park with just the right environment to provide you with the rest and relaxation you need as you enjoy all the wonders that this beautiful region has to offer. This park is within walking distance of the Three Sisters, and makes the perfect launching point for any excursions into the Blue Mountains. Katoomba's pubs, cafes, and other sites are close enough to enjoy as well. There are unpowered sites for camping and powered locations for caravans. You'll find amenities like Wi-Fi, a camp kitchen, barbecues, and a laundry, as well as a playground for the kiddies. This park, like the one in Blackheath, is operated by the Blue Mountains City Council, and designed to provide travelers with everything they need to make the most of their time in the area! For campers looking to save on park fees or simply rough it, there are a few free locations where you can park your van or set up a tent. Ingar Campground, close to Wentworth Falls, is one such place. It has only toilets, tables, and barbecue pits, so you'll have to bring water, food, and everything else you need. Murphy's Glen is another free site inside the Blue Mountains National Park. Located near Woodford, it too provides only toilets and cooking areas.